The company flew a drone at a nuclear facility for the first time at its Prairie Island plant in the summer and has now used a drone to carry out an inspection of a cooling tower at the Monticello plant, the company said on 25 October. "Xcel Energy is committed to using new technology that improves safety and reduces costs for customers, and operating drones to complete inspections delivers those benefits," Kent Larson, Xcel Energy's group president for operations, said. "With the ability to provide real-time, high-resolution images, the drones are providing better quality data and enhancing safety." 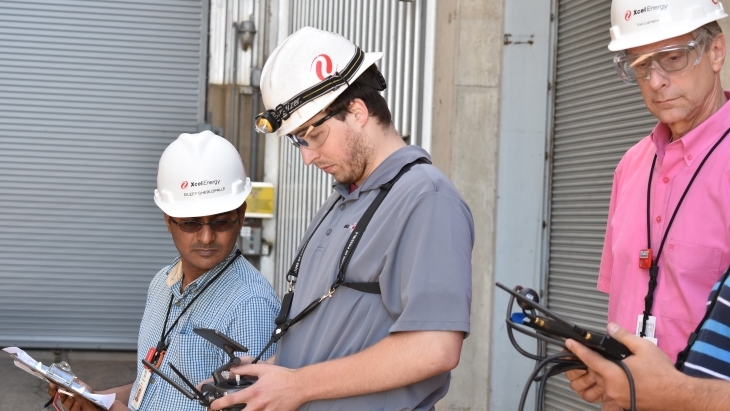 A small unmanned aircraft used to assess the exterior of two reactor buildings at Prairie Island in July completed the work in two days, providing high-quality data and reducing the cost of the surveys which typically require a crane and about a week of work. Eliminating the need for a crane kept the crew on the ground for the majority of the inspection, improving safety, the company said. Similar safety and cost benefits were realized on 23 October when a drone was used to inspect a cooling tower at the Monticello plant. "Increasingly, our customers want clean energy and in the Upper Midwest, our nuclear facilities deliver more carbon free energy to our customers than any other source. In addition to providing environmental benefits, nuclear energy is unmatched for reliability," said Tim O’Connor, Xcel Energy's chief nuclear officer, said. "We are striving for new ways to improve our plant operations and drone technology is helping us achieve superior levels of safety and drive down costs." Xcel Energy has used drones to inspect utility infrastructure including wind turbines, power lines, natural gas lines and electric substations since 2015. It has partnered with the US Federal Aviation Administration to advance operational and safety requirements for unmanned aircraft in the utility industry nationwide. The company also recently began to use drones for ongoing power line inspections with flights currently taking place in Colorado. The company plans during 2019 to operate drones remotely to inspect power lines in ten states where it maintains electric infrastructure.